There are many benefits to joining a fraternity and especially FIJI. We provide the opportunity for leadership, academic assistance, career development, community service, planned and informal social events, intramural competition, and housing. Our pledge process has always reflected the philosophy of encouraging cooperation and respect and instilling the values our house embodies. We do this all while ensuring your college career gets off on the right foot. Upon signing your bid, if extended one, we provide you with Scholarship Chairs and Freshmen Advisors who assist you in making your schedule, tutoring, getting involved on campus, and ensuring that your transition to college is as smooth as possible. Zeta FIJI has won the Jordan Bowl, an award going to the top academic FIJI chapter in the nation, 4 out of the last 7 years. Additionally, our Chapter is always competitive and has won the Cheney Cup 9 times, awarded to the top FIJI chapter nationally. FIJI also is routinely in the top 3 fraternities on campus in academics and we have exceeded the IU men’s all-campus GPA average for 33 consecutive years. We have won the campus intramural trophy in 31 out of the last 34 years. Due to our strong emphasis on scholarship, FIJI has its own educational foundation contributing more than $10,000 per year in scholarship rewards to brothers who achieve a 3.0+ grade point average. 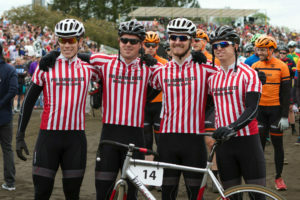 We rank first all time in Little 500 race standings. We also have continued to raise the largest sum of money of all participating organizations for IU Dance Marathon benefiting Riley Hospital for Children every year since its inception in 1993. 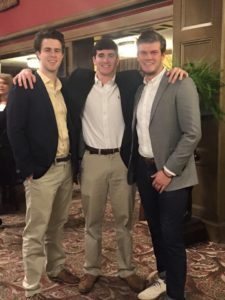 Zeta FIJI has had 100% graduation rate every year and also is extremely successful in either placing graduates in full-time jobs or in graduate, medical, dental or law school. Last year’s class had 100% job placement including brothers with jobs from all over the country, including New York, Chicago, Indianapolis, Pittsburgh, Denver, and Austin. Over the past couple of years we have had job offers extended to brothers from companies such as JPMorgan, Goldman Sachs, Ernst & Young, KPMG, Merrill Lynch, Bain & Co., CitiBank, Lincoln Financial, Bank of America, Aon, Deloitte, General Motors, PriceWaterhouseCoopers, Cummins, and General Electric.